Since 2004 I have been collecting and studying mushrooms in the Dominican Republic: all this has been possible thanks to the collaboration and encouragement that the National Botanic Garden of Santo Domingo has always shown to be appointing me as a research associate and making available the herbarium where I could deposit all my collections once they were determined. A heartfelt thanks to the Director of Botanical Garden dr. Ricardo Guarionex García, the Deputy Director dr. Francisco Jimenez, the Curator of the herbarium dr. Alberto Veloz and his assistant dr. Yulei Incarnacion, and Botany Director dr. Brigido. Over the years I have been able to collect and photograph in habitat more than 1.200 collections, of which, about 400 have been determined and deposited in the herbarium of the Santo Domingo National Botanical Garden (JBSD – see “Fungal Herbarium). Up until now I have discovered, sequenced and published 25 new species, a new Subgenus and a new Section (see “My new taxa discovered in DR”). Another 28 new species and 2 new Genera are being published. Many known species have been determined (see “Fungal Species Determinates”), other species have not yet been determined and are being studied (see “Fungal Species Undetermined”). The mycological biodiversity of the Dominican Republic is remarkably high so there is still a lot of work to do to have a fairly complete picture of the mushroom species on this Caribbean island. 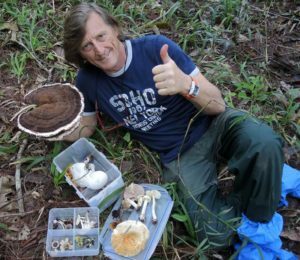 The aim of this site about Neotropical Fungi of the Dominican Republic, is to encourage biologists and mycologists, both national and international, to devote themselves to the study of fungi of this Country, very rich in species but not systematically and continuously investigated.